Today, author Matthew Quinn Martin has stopped by to answer a few questions. His debut novel, Nightlife, is out this Monday, October 21 from Pocket Star. The blurb: "For centuries an ancient evil has slept beneath the streets of New Harbor. This Halloween, it wakes up. He tells Beth the hideous truth about the nightmare creatures that have haunted mankind’s imagination for eons—creatures the world calls vampires. Together they are the only hope for New Harbor, but to defeat what lurks in the shadows they’ll have to conquer something far stronger than fear—their own desires." Action, a bit of romance, and some no-good, very-bad vampires, you know it had to go on my TBR list. Matthew was a treat to interview and I am insanely jealous that he lives on an island. It's not a tropical island, but still - island! I do have better internet here in my landlocked home, and I would miss streaming Netflix, but I would probably get more done. Something to remember as Nano looms on the horizon. KF: Thank you so much for your time and for visiting Stellar Four and congrats on the release of Nightlife! MQM: Thank you…and thank you again for having me. KF: I am going to go out on a very short limb and guess that you favor the monstrous vampire. Are there any less-monstrous vampires that you enjoyed reading/watching? MQM: It’s not that I favor the monstrous vampire exactly. I just felt that now was the time for it to make a comeback. There’s an entire book (if not library’s) worth of material on why different takes on this enduring mythic archetype are popular at different times. But for Nightlife I thought it would be fun to just throw away all of the post-Dracula, post-Interview with the Vampire, tropes and think of new ways to explain the old legends. While I was working on Nightlife, I pretty much quarantined myself from any contemporary vampire-themed fiction, films and TV shows. I wanted to avoid as much outside influence as possible. However, I did break down and watch Park Chan-Wook’s amazing film Thirst…but that’s because I’m such a big fan of his work. And after I handed Nightlife into my editor, I read my friend (and former office-mate) M.L. Brennan’s Generation V––which also has a take on vampires that deviates significantly from the standard mold––and enjoyed that quite a bit. KF: What are some of your influences? What are your favorite "monstrous vampires"? …and, of course, Stephen King…who has got a lot of fantastic monstrous vampires popping up in his work––Barlowe in Salem’s Lot, the never named “Night Flier” as well as the various types of vampires in the Dark Tower cycle. MQM: I too find social media to be exhausting, and often times far too impersonal. I understand it’s importance, but I’ve slimmed my participation in it down over the years. As far as social networking, I only do Twitter. And after many (many) false starts, I’ve stopped putting pressure on myself to keep my own blog. I’m going to leave that to the people whose talents lie in that arena (like you fine folks, for example). KF: I love that Nightlife happens around Halloween, the most important holiday of the year. What books do you read to get in the spirit? What movies do you watch? MQM: It’s probably a happy accident, but right now I’m reading my way through the EC Comics archives (Tales from the Crypt, Haunt of Fear, etc. )…those are perfect for Halloween, especially at bedtime. As for movies, I’m also going into the…ahem…vault for that and watching a lot of the original episodes of The Outer Limits (which too often gets unfairly compared to (and/or lumped in with) The Twilight Zone. KF: Action scenes might be my one true book love. How do you go about writing them? Do you spend a lot of time on youtube? MQM: I actually started out as a screenwriter, and Nightlife’s earliest incarnations were as a screenplay. Action is something that lends itself quite nicely to a visual medium like film. I’ve found writing action scenes in straight prose to be much more challenging, however. But I feel that at the heart of it––in books or on film––if action isn’t balanced by tension then it’s just so much running around. KF: There is a scene where Beth sees what a vamp really looks like away from the glamour/venom influence. This gave me some very trippy dreams. 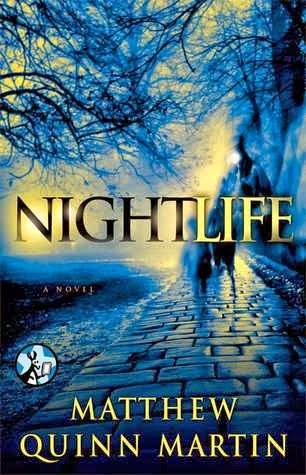 Did you have any freaky dreams while writing Nightlife? Cause, you know, justice/karma/whatever. MQM: Yes…ahem…sorry about that. Although, telling a horror writer that his/her book gave you nightmares is just catnip for us. But to answer the question––I do have nightmares, and I have them quite often. The most common is one where I’m being chased, and a lot of times I’m being chased underground. So this might be a chicken/egg thing when it comes to which came first…the nightmares or the Nightlife. KF: What do you have planned next for this world? Future books? Anything new you are working on? MQM: I’m currently working on the next novel in this series (Nightlife: As the Worm Turns), which is due to come out sometime next year. I’m trying not to think too far past that one. I do have a “trunk novel” I might rework, and there’s a stand alone supernatural horror I’ve got cooking that I’d like to tackle at some point…plus partner-in-crime/frequent collaborator Libby Cudmore and I have a couple of top secret projects we’ll be unveiling soon(ish). KF: Firefly, Buffy, Sherlock, Doctor Who or BSG? MQM: I did like Buffy (and Angel) quite a bit. In fact, Firefly is probably the only one of Joss Whedon’s forays into television that I wasn’t totally on board with. It seemed like a great concept that just couldn’t hold together over the long haul, and would have (and eventually did) work much better as a feature film. I’m still waiting for Netflix to put out season one of Sherlock out on DVD––so I’ll have to get back to you on that. For all the hype, I could never get into the reboot of Battlestar Galactica (and I’m afraid if I re-watch the originals they won’t live up to my inner five-year-old’s remembrance of them). I guess that just goes to show you that not everything is for everyone. I love Doctor Who though––both the classic and the new stuff (Steven Moffat really is an insanely gifted writer/producer). Peter Davidson was my favorite Doctor until David Tennant…now they are tied. Although I hope they go the William Hartnell route with a slightly older actor for the next Doctor––Hugh Laurie’d be my pick (and I doubt I’m alone in thinking that). KF: Thank you so much!